A key issue is students with disability. The Committee specifically requested information in relation to students with disability. Although the Committee did not receive a great deal of evidence on students with caring responsibilities, the evidence that was received was instructive, and appreciated. Accordingly, the Committee felt it was important to include this evidence in the report. Accordingly, this chapter outlines programs the Australian Government have in place to support students with disability, evidence from submitters and some recommendations flowing from that evidence. However, as the evidence, and the conclusions drawn from it, are limited, the following should be read in the context of the Committee’s belief that additional witnesses should be given the opportunity to present to a future inquiry to inform a more considered series of recommendations, consistent with the importance of effectively responding to this challenge. The Committee is of the view that the complexity and importance of supporting students with disability warrants further consideration, to do justice to the issues that arise in relation to inclusion in education and employment for all young Australians. … to claim a payment for completing a PaTH internship in the new funding model to be introduced from 2018. Where DES providers are at a disadvantage is that the Youth Bonus wage subsidy ($6,500 - $10,000) is only available to job seekers who are registered with Jobactive or Transition to Work. Details on these areas are outlined in the following figure. 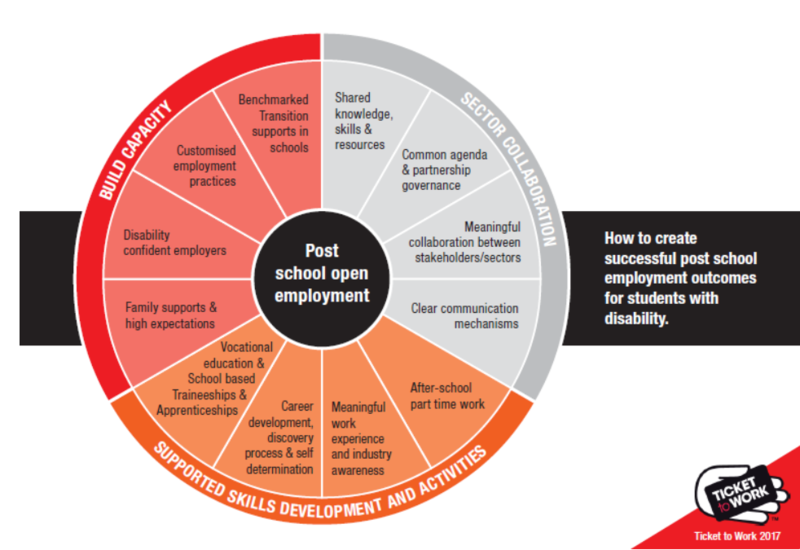 The evidence above highlights that in order for students with disability to successfully transition to work a respect for the abilities of students with disability and provision of documentation and services in a way that is accessible coupled with early intervention and careful planning and assistance by someone with knowledge of disability is needed. This recommendation by CYDA addresses many of this issues brought to the Committee’s attention. It is too early to tell whether the NDIS will lead to the economic participation benefits that were predicted. There are a number of reasons why increased economic participation flowing on from the NDIS may take some time. NDIS-funded initiatives to engage community and businesses to improve employment outcomes for people with disability have not occurred yet. implement a strategy to increase the number of female young carer bursary recipients. that the Australian Government invests in and commits funding to meet the service demands of the Young Carers Respite and Information Services initiative to young carers in need. … assists students with a significant caring role who need support to complete their secondary education or the vocational equivalent due to the demands of their caring role. The Young Carers activity is a targeted measure and seeks to supplement existing programs and services, not replace them. Respite and education support services – assists students up to and including 18 years of age with a significant caring role to access respite and age appropriate educational support. These services are delivered by the national network of 54 Commonwealth Respite and Carelink Centres (CRCCs). The evidence received highlights the resilience that young carers in Australia show and notes the programs that the Australian Government has in place to assist young carers. Whilst the Committee acknowledges the important programs the Australian Government has in place to support students with disability in their post school transition the evidence is clear that more needs to be done. In this context the Committee was heartened by the Ticket to Work program. This program shows the importance of individual engagement, engagement with employers and work experience in assisting students with disability into post school employment. The Committee recommends that the Australian Government Department of Social Services continue to support Ticket to Work. The Committee was concerned with evidence that information and testing such as NAPLAN offered to students who are blind or have low vision is provided and carried out in an accessible manner. It is important that this be corrected and the Committee makes recommendations in this area. Noting the NDIS is continuing to evolve, the Committee echoes the words of Vision Australia that it ‘should not yet be relied upon as the solution to successful school to work transition for people who are blind or have low vision’54. The Committee would extend this caveat to all people with disabilities. Given that an employee registered with DES can only claim Restart money ($10,000) but not the Youth or Youth Bonus ($6,500) the Committee would recommend that the wage subsidies Youth Bonus and Youth be open to employees who are registered with Disability Employment Services. In chapter four, the Committee acknowledged and agreed with evidence regarding importance of career advisors. The Committee extends this view to career advisors, who are appropriately trained in assisting and advising students with disabilities. Young carers are definitely remarkable people. They deal with the usual stresses of education and transition to employment, in a situation in which they must take the care needs of another person, often a parent or a sibling, into account. Given this, the Committee endorses many of the recommendations as set out by Carers ACT. The Committee recommends that the Australian Government, through the Department of Social Services continue to support Ticket to Work. follow up with young people post school. The Committee recommends that measurements of gain within schools, such as NAPLAN, are made accessible to students who are blind or have low vision. The Committee recommends, in relation to students who are blind or have low vision, that all information offered to students about further education, training and employment outcomes is provided in accessible formats. The Committee recommends that career advisors be appropriately trained in assisting and advising students with disabilities and students who are carers. The Committee recommends that the wage subsidies Youth Bonus and Youth be open to employees who are registered with Disability Employment Services. the Australian Government invests in and commits funding to meet the service demands of the Young Carers Respite and Information Services initiative to young carers in need. The Committee recommends that the Australian Government rethinks the way it determines its young carer policies so that young carers are identified and supported at the beginning of and along their caring path with timely, responsive and appropriate interventions to ensure that they complete their education and transition to further study or employment, while maintaining their caring role. See <https://www.dss.gov.au/disability-and-carers/programmes-services/government-international/national-disability-agreement> accessed 15 January 2018. Council of Australian Government, National Disability Strategy 2010 - 2020, p. 8. See <https://www.dss.gov.au/sites/default/files/documents/05_2012/national_disability_strategy_2010_2020.pdf> accessed 12 December 2018. Council of Australian Government, National Disability Strategy 2010 - 2020, p. 53. See <https://www.dss.gov.au/sites/default/files/documents/05_2012/national_disability_strategy_2010_2020.pdf> accessed 12 December 2018, also quoted by Australian Network on Disability, Submission 70, p. 4. Council of Australian Government, National Disability Strategy 2010 - 2020, p. 53. See <https://www.dss.gov.au/sites/default/files/documents/05_2012/national_disability_strategy_2010_2020.pdf> accessed 12 December 2018, also quoted by Australian Network on Disability, Submission 70, p. 54. Council of Australian Government, National Disability Strategy 2010 - 2020, p. 53. See <https://www.dss.gov.au/sites/default/files/documents/05_2012/national_disability_strategy_2010_2020.pdf> accessed 12 December 2018, also quoted by Australian Network on Disability, Submission 70, p. 55. Council of Australian Government, National Disability Strategy 2010 - 2020, p. 53. See <https://www.dss.gov.au/sites/default/files/documents/05_2012/national_disability_strategy_2010_2020.pdf> accessed 12 December 2018, also quoted by Australian Network on Disability, Submission 70, p. 56. See <https://www.dss.gov.au/our-responsibilities/disability-and-carers/programmes-services/disability-employment-services> accessed 8 December 2017. Australian Network on Disability, Submission 70, p. 6. Australian Network on Disability, Submission 70, p. 7. Ms Kerrie Langford, Manager, National Employment Manager, National Disability Services, Transcript of Evidence, Sydney, 19 September 2017, p. 32. National Disability Services, Submission 22, p. 8. Australian Government, Department of Employment, Wage subsidies factsheet – employers, 19 April 2017, p. 1. See <https://docs.employment.gov.au/system/files/doc/other/wage_subsidies_factsheet_-employers_19.4.17_final.pdf> accessed 11 December 2017. See <https://www.dss.gov.au/disability-and-carers/programmes-services/for-service-providers/australian-disability-enterprises> accessed 8 December 2017. See <https://www.ndis.gov.au/people-disability/sles> and Australian Network on Disability, Submission 70, p. 7. See <https://www.education.gov.au/what-nationally-consistent-collection-data-school-students-disability> accessed 12 December 2018. Australian Network on Disability, Submission 70, p. 5. See <http://www.tickettowork.org.au/supporters/> accessed January 17, 2018. See <http://www.tickettowork.org.au/what-we-do/> accessed January 15, 2018. See <http://www.tickettowork.org.au/what-we-do/> accessed January 15, 2018 and National Disability Services, Submission 22, p. 6. Ms Suzanne Colbert, Chief Executive Officer, Australian Network on Disability, Transcript of Evidence, Sydney, 19 September 2017, p. 33. Children and Young People with Disability Australia, Submission 74, Appendix 1, p. 8. Mr Paul Cain, Inclusion Australia, Transcript of Evidence, Melbourne, 18 September 2017, p. 46; Ms Stephanie Gotlib, Chief Executive Officer, Children and Young People with Disability Australia, Transcript of Evidence, Melbourne, 18 September 2017, p. 46. Blind Citizens Australia, Submission 66, p. 4. Vision Australia, Submission 7, p. 3. Ms Kerrie Langford, Manager, National Employment Manager, National Disability Services, Transcript of Evidence, Sydney, 19 September 2017, p. 31. Ms Taye, Morris, Manager, Careers and Employment, University of New South Wales Sydney, Transcript of Evidence, Sydney, 19 September 2017, p. 20. Ms Kerrie, Langford, Manager, National Employment Manager, National Disability Services, Transcript of Evidence, Sydney, 19 September 2017, p. 32. Children and Young People with Disability Australia, Submission 74, Appendix 1, p. 45. Vision Australia, Submission 7, p. 6. Carers ACT, Submission 12, p. 4. Ms Lisa Kelly, Chief Executive Officer, Carers ACT Ltd, Transcript of Evidence, Canberra, 4 September 2017, p. 22. Carers ACT, Submission 12, pp. 6-10. Ms Lisa Kelly, Chief Executive Officer, Carers ACT Ltd, Transcript of Evidence, Canberra, 4 September 2017, p. 25. Carers ACT, Submission 12, pp. 11-12. See <https://www.dss.gov.au/disability-and-carers/programs-services/for-carers/young-carer-bursary-programme/young-carer-bursary-program-evaluation> accessed 8 December 2017. See <https://www.dss.gov.au/disability-and-carers/programmes-services/young-carers-respite-and-information-services> accessed 7 December 2017. Children and Young People with Disability Australia, Submission 74, Appendix 1.